Games Workshop and Behaviour Interactive are taking another run at a Warhammer 40K MMO. It was just over a year ago, in the dying days of THQ, that Warhammer 40,000: Dark Millenium Online dropped the "Online" part and went from an MMO to a more conventional RPG. What's happened to it since then is unclear - it still hasn't been released and the studio working on it, Vigil Games, followed the THQ swirl into oblivion - but the bottom line is that the dream of a Warhammer 40K MMO was over. But not over. 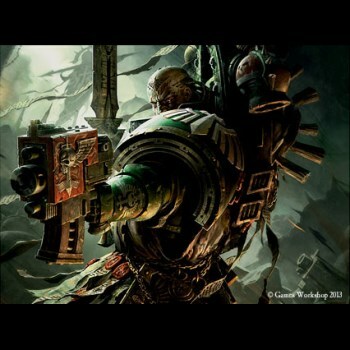 Behaviour Entertainment has announced that it's working on a "wholly new MMORPG persistent war experience" called Warhammer 40,000: Eternal Crusade, in which players will join one of four WH40K factions - the Space Marines, Chaos Space Marines, Orks and Eldar - and take part in massive battles, with thousands of players simultaneously warring for control of an entire planet. Gameplay will happen in over-the-shoulder third-person with "precision gunplay and brutal melee combat," vehicles like the Space Marine Rhinos and Ork Battlewagons will be on hand, "Battle Squads" can be created or joined and content will be procedurally generated, although how exactly that will work remains to be seen. Behaviour Interactive, previously named Artificial Mind and Movement or A2M, isn't exactly a big name in the world of MMOs, but online studio head Miguel Caron said that everyone working on the new game are "MMO development veterans," so that's a plus. Warhammer 40,000: Eternal Crusade is being developed for the Xbox One, PlayStation 4 and PC, and is slated to come out in late 2015; in the meantime, you can take an early look at what's going on at bhvr.com/eternalcrusade.